Anders, Abram. “My Favorite Technology Assignment: Collaborative Invention and Brainstorming.” 78th Annual Association for Business Communication Convention. New Orleans, LA. October 2013. Whalen, D. Joel, Abram Anders, et al. “Selections From the ABC 2010 Annual Convention, Chicago, IL.” Business Communications Quarterly. 74.3 (2011): 356-372. 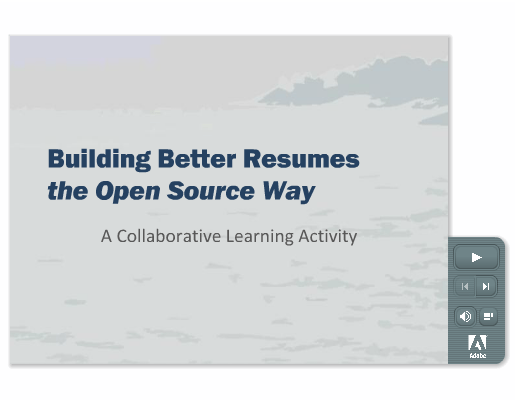 “Building Better Resumes the Open Source Way”: My favorite assignment applies open source production strategies and crowd sourcing principles to the task of creating better bullet points and skills descriptions for resumes and job applications. My assignment not only provides a novel and engaging interface for student learners, but also overcomes a traditional pedagogical challenge. Students often recognize the difference between “good” and “bad” examples, but struggle bridging the gap between the two in their own writing. By crowd sourcing the invention and revision processes the “open source way” interrupts single author inertia and helps students realize a wider range and more refined applications of the available means of persuasion.